MBL Season’s Greetings & New Year Newsletter 2013! MBL London Head Office wishes you and your family a Happy New Year! It’s very difficult for me to let 2012 pass since it was an unforgettable year for MBL and also has given me so many friends during work with MBL adoptive families, media talks, the worldwide book tours, and the universities’ lectures. Great thanks to those Chinese adoptees and MBL families for sharing their stories with us and their trust to MBL! Meanwhile, respects to MBL’s growing volunteer teams – London SOAS/LSE/King’s College/Queen Mary, Cambridge, Oxford, and Bath University, MBL Nanjing BaiXia Children Centre, and many newly joined volunteers from different places in China and around the world! Without your help and support, MBL’s mission would be only in words on piece of paper! You ALL have made a wonderful MBL 2012 as history makers! 2013 is a little dragon year – can we call it “baby dragon year”? We all need some time to grow our ideas, passion and love! Looking forward to your continuous Love to our Chinese children! Please contact us if you would like to support MBL! From London Head Office, guided by MBL Trustees Ching-He Huang, Jeremy Gordon and Toby Eady. More MBL activities in 2012 can be found on MBL Newsletters on Facebook and 母爱桥每月简讯on MBL Weibo…both two pages were set up and managed by very few hands but with very hard and heartfelt work! • For Adoptive Families, MBL volunteers have helped so many families to confirm their Adoption Documents and Family Roots Information! We didn’t realise that before — MBL could be everywhere for western adoptive families’ needs in China! • For Disadvantaged Children in China, MBL supported 8 Children’s Libraries in Sichuan. It’s always wonderful to see beautiful and happy smiling on children’s faces! • For MBL Volunteers, we provided opportunities for them to get involved in London Book Fair – China Year; Language support during the Olympics and MBL events for adoptive families with their beloved Chinese kids in different countries. They also got supported by MBL Workshop and Training sessions. • Adoption Documents and Family Roots Information checking for MBL family members. • An MBL new project called “Who Am I” (see post to follow), which is to benefit Chinese adoptees, western born Chinese, and even anyone who adopted other cultures apart from their original culture in their daily life. February – MBL might get a chance to see some Dutch families with adoptive Chinese children again during Xinran’s lectures at Tilburg University in Netherlands in the end of month. March – CACH (Children Adopted from China) families in the UK 2013 Annual Reunion will receive gifts from MBL: Children Arts Workshops, Chinese Minority Fashion Exhibition and Xinran’s Q&A with CACH parents. April – We hope snow-white Finland has been turned green by spring and bring some new friends to MBL when Xinran is on her book tour there. May – Would be a very busy month for us! American adoptive families could have given MBL some ‘homework’ in advance, so Xinran & MBL are able to deliver our answers to adoptees and families during Xinran’s visiting between a few cities in USA. August/September – MBL will go back to Norway to hug our little Chinese friends with their much loved Norwegian families during MBL’s Workshops there! September/October – In Italy, we hope to meet up with some MBL families and Italian volunteers during MBL’s work with HOW (Hand Off Women) conference. • Setting up a team to collect updated information of Orphanages in different places in China. So we could find out how to help/support those Orphans in different situations more effectively. • Funding more Children’s Libraries in rural areas in China. October & November – Team for supporting family events during V&A Museum (London) Chinese Painting Exhibition. Thanks for your continuous Support and also please keep updated with us through MBL Website, Facebook, Weibo, and Twitter! Have a great 2013 ahead! I like to share some information with you about me because I hope to find my birthparents sometime. I was born in China, but live in the Netherlands now. My name is Annemarije Cornel and I am thirteen years old. My chinese name is Wu Xin Rong and in 1999, at the the age of two-and-a-half years, I was adopted by my Dutch parents. I have a sister, age nearly 16, who is adopted from China also, from Zongshan in Guangdong. She is called Nynke (Chen Bai Lian). At the moment I live with my parents and sister in a small village in the Northwestern part of the country, called Schoorl. It is situated near the Northsea and has beautiful beaches and sanddunes. I am in my second year of secondary school now and I love to do sports. I used to do a lot of gymnastics, now I play football in a girlsteam. I also like to sing and I play the violin. I have a lot of friends and they are very important to me. I love animals too, especially our pets. I am really happy to live in Schoorl. I have been to visit China in 2006. We visited the orphanage were I grew up in Wuhan. It was great to meet some of my carers and some of the children who still live there. It was very impressive because they could remember me and they gave me some photographs of when I was a baby. It was nice to see the room where I had played and slept years ago. We managed to sing a few Chinese songs for the children and they sang for us in return. We also visited Guangzhou and the mountains in the Guilin region. Now I grow up I think more often about China and my background. When I was younger we all took Mandarin lessons in a Chinese school. I have two cousins who are also adopted from China. We have a little Chinese group in our family and I think that is very nice. From my adoptionpapers I know that my Chinese name is Wu Xin Rong. I was born on April 3, 1999 and found to be abandoned in Hongshan District, Wuhan City, Hubei Province on April 28, 1999. Than they send me to the Wuhan Children Welfare Institute of Hubei Province by the Local Police Station of Hongshan Villages, Wuhan City Public Security Bureau, Hubei Province on April 28, 1999. My parents and other relatives couldn’t be found at that time. I wish I could find my birthparents, although I know it will be difficult as we don’t have any information about them. It is important for me as it is a very important part of me and of my live. I hope they are well and wish they are happy. Maybe we will meet in the future. Tears fell from my eyes as I finished the last pages of Messages from an Unknown Chinese Mother, which holds the stories of mothers who were forced to give up their children. It has provided me with the answers that I never knew. Its honesty, pathos, and raw emotion have greatly touched me. I am a sixteen-year-old girl who was adopted from Wuhan, China at fifteen months old. I now live in Boston, Massachusetts with a loving and supportive family. Throughout my life, I have faced an identity issue. I look Chinese, but on the inside I feel white. With whom can I identity? Who was my birth mother? Why did she abandon me? I am grateful that you have published your books because they allow me to access the world of Chinese women and learn about the difficulties that they endured. I am not mad at my birth mother for leaving me to be found by someone else. Instead, I am thankful for her for giving me life. I now know that she really did love me. I only wish that her life is improved and that she is happy. At sixteen years old, I am growing as an individual and creating new experiences. I am grateful for my birth mother and parents. I cherish my life in America and the opportunities that I have. I have always wondered what my life would have been like if I lived in China. Would I be a migrant worker or an indigent farmer, bear the burden of the less fortunate, and have to struggle for education? My Chinese mother must have faced adversity; otherwise, she would not have left me. Although it is heartbreaking that we are separated, I am thankful for the life that I have and for my future. I go to a public school in Boston, and I am motivated to do well. I now look towards life with a new perspective. I want to take full advantage of what I am given, and be happy and healthy. I am in my fourth year of learning Mandarin at school. Despite its challenge, I feel that it serves as the gateway to my Chinese heritage. In fact, this summer I received a National Security Language Initiative for Youth scholarship to study abroad in Beijing for five and a half weeks. In addition to learning Chinese, I also visited the Dandelion School. The Dandelion School is a middle school for children whose parents are migrant workers. For a weekend, I taught them English and played with them. During that trip, I also volunteered at the New Hope Foster Home. New Hope takes in babies with physical disabilities from government orphanages, and it provides them with surgery so that they can be adopted. Although I did not return to my birth city, my return to China was a great experience, and I definitely want to go back. Thanks for allowing Chinese adoptees to learn about our Chinese mothers. Our Chinese mothers loved us and always will. My message to them is that they remain in our hearts. Love is full of hope, and the bond that it creates is indestructible. We know a lot of you are already active on social media such as Weibo, Facebook and Twitter – so please link with us and help spread our news! Would you like to team up with MBL founder XINRAN as a MBL Group – Supporting disadvantaged children in China – to participate PAWA WALK on Sunday 23rd September at Regent’s Park? MBL will be the ONLY China-related charity that is going to participate! • For students, you don’t need to register on line. Please simply send your full name, address, and your T-shirt size to us at: headoffice[at]mothersbridge.org. MBL will sponsor the FIRST 10 students of doing this. Meanwhile, we will offer one year FREE MBL Student Membership (including FREE invitation for more MBL future events, FREE MBL T-shirt, one FREE Xinran’s book with her signature, Sharing of MBL Datas, MBL’s support in China for your travel…etc.) to any student participants who could raise more than £50 for MBL (for donation details, please see below). • For individual/group/family who have registered on line at: http://www.doitforcharity.com/pawawalk, please forward your register details and T-shirt size to us at: headoffice[at]mothersbridge.org. Meanwhile, we will offer one year FREE MBL Individual/Family Membership (including FREE invitation for more MBL future events, FREE MBL T-shirt, one FREE Xinran’s book with her signature, FREE MBL children’s publications, Sharing of MBL Datas, MBL’s support in China for your travel…etc.) to each participant who could raise more than £100 for MBL (for donation details, please see below). • For organisations who have registered on line at: http://www.doitforcharity.com/pawawalk, please forward your register details and T-shirt size of your group members to us at: headoffice@mothersbridge.org. Meanwhile, we will offer one year FREE MBL Organisation Membership (including FREE invitation for more MBL future events, FREE Xinran’s books and MBL’s publications, Sharing of MBL Datas, Your organisation’s LOGO/Link on MBL Website, MBL’s language/culture support to your event, MBL’s support in China for your travel…etc.) to your organisation if you could raise more than £1000 for MBL (for donation details, please see below). Date: SUNDAY 23 September 2012 from 10:00am. Route: A 5 kilometers walkathon in Regents Park. Walkers will receive a small bag of Asian Snacks after the walk. Family and friends are most welcome to come to cheer you on, and bring a picnic lunch to enjoy in the Park. Xinran and MBLers are looking forward to meeting you and your family there! Here is the latest info about TEDxShanghai 2012. The organisers are happy to support MBL with the printing out 1,000 copies of MBL’s brochures – and to offer tickets for MBLers! Please contact MBL IT Team Leader Xiangming (email: wangxmlx[at]gmail.com) for your tickets. Xinran, the Guardian 2011 World Top 100 Women, and the founder of MBL, met Nicole from Québec, Canada…one of the authors of “The Red Thread” – Messages to the Mothers of our Children Born in China” in London in September 2011 and was kindly invited to write the preface for this beautiful book. 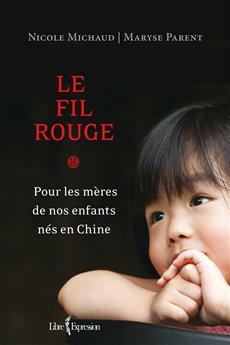 Eventually this book was published in its French version “Le fil rouge – Pour les mères de nos enfants nés en Chine” in early 2012. The book begins with Xinran’s heartfelt writing about her many years’ research and experience with adoptive families with Chinese children all over the world, and the amazing work and activities that her charity The Mothers’ Bridge of Love has been doing since it was set up in 2004 in th UK. Then it is followed by an introduction to the historical and social context that led to the adoption of Chinese children by Western families. The main body of the book consists of twenty anonymous testimonials by the adoptive parents to the birth mothers of their children born in China…with lots of joy and tears. Thanks for sharing those lovely “Red Thread” stories with MBLers all over the world…and also it is amazing that MBL’s LOGO – a beautiful Chinese Knot is made of Red Thread as well! The Mothers’ Bridge of Love (MBL), is proud to announce that together with Gallery Amichi from Australia and Nanjing BaiXia Children’s Palace (BX), MBL International Children’s Art Exhibition – Embrace Art from the World – was successfully held from 18th February 2012 to 17th March 2012 at BX. The International Children’s Art Exhibition Opening Ceremony attracted many different groups, including local families, education institutes, publishers, artists, media, and international friends (such as the representative of the UAE Ambassador)…As part of MBL charity event for children, Gallery Amichi BIG ONES LITTLE ONES® “Through my eyes” from Australia brought to Nanjing BX a collection of more than 120 pieces of art by children from 16 countries. MBL set up an Information Desk during the Exhibition, which helped people to know more about MBL: Who we are? What we do? How to be MBL volunteers or to join MBL as members? Nanjing Team Leader Zhu Li and her team members are encouraging people to get more involved in MBL’s current and future charity events. Ms Trish Amichi visited some local kindergartens and primary schools, such as Plum Mountain Kindergarten, Nanjing No.1 Kindergarten, ChaoTian Palace Minority Primary School (school for migrant workers’ children), Nanjing Guanghuamen Primary School, and Nanjing Yu Zhi (Special Needs School). As a very passionate and active MBL volunteer, she also kindly ran workshops for the children during her visit. It was MBL’s founder, Xinran, whose support letter helped him to apply for funding from the British Council so that he could go to China three times. From those trips he produced a collection photos about China, and MBL arranged lots of volunteers to support his photo shoots. Some of the volunteers were children from Nanjing BaiXia Children’s Palace, which is now MBL’s base in China. 57 of those photos have been bought by the V&A museum and will be exhibited in July 2012. Hope you had a lovely Chinese New Year Celebration no matter where you are! MBL London Head Office would like to share some nice memories with you here, which you could see that MBLers coming from differeent part of the world are gathering together for a lovely MBL’s Chinese New Year Party. – Friends from Italy and US with MBL Founder Xinran and XIAO Li from MBL London Head Office…MBL is willing to build up the bridges between China and the rest of the world, between birth and adoptive cultures, between poor and rich! – MBL Events Team and MBL Student Society Team (SOAS, Oxford, Imperial)…discussing the MBL Project of supporting 2012 London Book Fair -China Market Focus and the MBL Project of setting up Information Desks for supporting 2012 London Olympics. Please contact us at: headoffice@mothersbridge.org for more information. We hope you can see that together we are a big MBL family trying to do our best for those beloved Chinese children!